This exciting early childhood program guides children along the proven track to academic success! The DLM Early Childhood Express® offers a comprehensive child-centered curriculum with teacher support and 21st century technology. The DLM Early Childhood Express is a holistic, child-centered program that nurtures each child by offering focused, meaningful instruction that is developmentally appropriate. The complete system provides a wealth of English and Spanish materials to help foster the social-emotional, intellectual, and physical development of children. Mathematics is based on Building Blocks, the result of NSF-funded research, and designed to develop children's early mathematical knowledge through various individual and group activities. Fine arts provides student opportunities for expressing art, dance, and music. 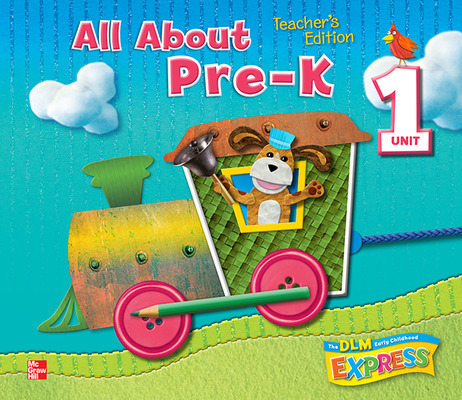 The DLM Early Childhood Express provides literature, technology, and teacher resources in English and Spanish to help every teacher set up and deliver a dynamic learning environment for all children. Teacher's Editions - Each of the 8 Teacher's Editions focuses on a specific theme and contains explicit, systematic instructions. There is one bilingual book for each four-week theme, providing essential questions for each lesson as well as plans for centers and suggestions for classroom management. Teacher's Treasure Book (Bilingual) - Features songs, traditional read alouds, folk tales, finger plays, and flannel board stories with patterns. Photo Library DVD (Multi-Language) - Contains vivid pictures of vocabulary terms in 10 languages with audio pronunciation, flash cards, and sorting games. Rhymes and Chants Flip Chart/CD (Bilingual) - Children practice music skills using the Rhymes and Chants Flip Chart which supports oral language development and phonological awareness in both English and Spanish. An Audio CD is included and provides a recording of every Rhyme and Chant. Making Good Choices Flip Chart/CD (Bilingual) - Provides illustrations to allow students to explore social and emotional development concepts while facilitating classroom activities and discussion. 15 lively songs recorded in both English and Spanish address key social emotional development themes such as joining in, helping others, being fair, teasing, bullying, and much more. Math and Science Flip Chart (Bilingual) - Is a demonstration tool that addresses weekly math and science concepts through photos and illustrations. Alphabet Wall Cards (English and Spanish) - Help students learn the names and shapes of letters and the sounds connected to the letter. The name of the picture on each card contains the target sounds at the beginning of the word for most consonants and in the middle for short vowels. Oral Language Development Cards (Bilingual) - Teach new vocabulary and are especially helpful when working with English Language Learners. Sequencing Cards (Illustrated) - Help children learn how to order events and the vocabulary associated with time and sequence. ABC Picture Cards (English and Spanish) - Help students learn the names and shapes of letters and the sounds connected to the letter. The name of the picture on each card contains the target sounds at the beginning of the word for most consonants and in the middle for short vowels. ABC Label Takehome Books (English and Spanish) - Blackline Master that provides each letter of the alphabet. DLM Research and Professional Development Guide - Provides background information on important research in early childhood and how the DLM Early Childhood Express incorporates best research practices. Teacher tips are also included for children with special needs and multicultural and English Language Learners. Home Connections Resource Guide (Bilingual) - Provides weekly letters home and take-home story books. Big Books Packages (English and Spanish) - Big Books reinforce each week's theme and the unit theme. Selections include stories originally written in Spanish as well as those written in English. Complete package includes 24 English Big Books and 24 Spanish Big Books (48 total). Concept Big Books (English and Spanish) - Non-fiction selections that introduce the essential questions for each unit and help children make their connections between their background knowledge and unit themes. Complete Package includes 4 English Concept Big Books and 4 Spanish Concept Big Books (8 total). ABC Big Books (English and Spanish) - Help children develop phonemic awareness and letter recognition. Little Books (6-packs) English and Spanish) - Reinforce each week's theme and the unit theme. Selections include stories originally written in Spanish as well as those written in English. Complete package includes 6-packs of each book, 24 for English and 24 Spanish (288 total). Listening Library CDs (8 CDs) (English and Spanish) - Are recordings of the Big Books and Little Books. These can be used in a variety of ways to model reading fluency, for read-alongs, to review and reinforce story content, and for pre-teaching of selections. Manipulatives Kit - This package includes fun tools for children to play and learn with in the classroom. Includes: Two puppets, Alphabet Letter Tiles (English and Spanish), Transportation and Farm Animal Counters, Two-Color Counters, Step-by-Step Number Line, Balance Scale, Pattern Blocks, Shape Sets, Connecting Cubes, Jumbo Hand Lenses, Magnetic Wands.